How far are we behind the Moon?? here in Berlin - even at a press screening? Anyway all press takes are over and we can see the film hitting the street next week ! GLOBAL VIRAL - yes I feel we need to go deeper - remember grappling and mind boogling her in this blog !? So grappling, grasping and groping ! is what we need! We played with the scales and proportions of scaling issues in metaphors and analogies, see about VIEWPOINT TRANSPORTATION systems and the impact of our mindsets for what we create for a Humane whatever: [link] See also: [link] One concern was always to be a ferment, lasting and seeding, and not as a catalyst, bringing and blowing-up for the surprise possible.... or not. The film is using a hot topic, what if a Virus is and maybe more than a Megaphor? So is the invisibel less or more dangerous !? 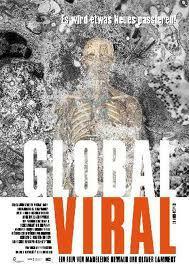 is it a global or glocal virus? even across issues and not just sectors? an in-betweener !?? and is he good or bad? doomed for the BAD or for the GOOD ? as cut-ups ! - gutartig (opposite to malicious) as William S. Burroughs, pointed out and made real for our imagination in movies. So there we are with Nietsche and challenges ! At this point I can only like to our ROBUST PATHS, but that meant to watch out, look-out, and consider testing in isolation and scaling. These recommendations from 1994 is really wht the film is about! Manage we all we can, eat we can, cause we can ?? Or do we need another awareness and policy sensibility? responsibel for what we cause, emotionally and intellectually ! as it can spread faster than we think, normally ..... but maybe this film is a wake-up call. so what is open-waht is closed ? what is inclusige and exclusing and dangerous, incredible or helpful/healing? In a nutshell WATCH YOUR WORDS AND METAPHORS and make your CONCEPTS REAL and SHARE CONTEXTS and ENVIRONMENTS.